People often ask what the difference between steel, stainless steel and cast iron pans is. What is the difference between a flat-bottomed pan and a wok-pan? Or why our flat-bottomed pans have higher rims than other manufacturers’ low-rimmed pans? A stainless steel pan has several advantages over a steel pan. It is easy to clean and maintain. It heats up very quickly. During cooking process, one must control that the heat wouldn’t go too high, and one must add more oil than on the steel pan. Stainless steel pan suits better for stewed dishes (steel pan can add color or flavor to the food if the seasoned layer becomes damaged). And another important aspect – a stainless steel pan always maintains its shiny appearance! The cooking features of a cast iron pan are the best. This is due to a thicker bottom. At the same time this can be a minus because the pan weighs a lot. For example, cast iron pans with a diameter of 50 cm or larger can weigh 30-40 kg. 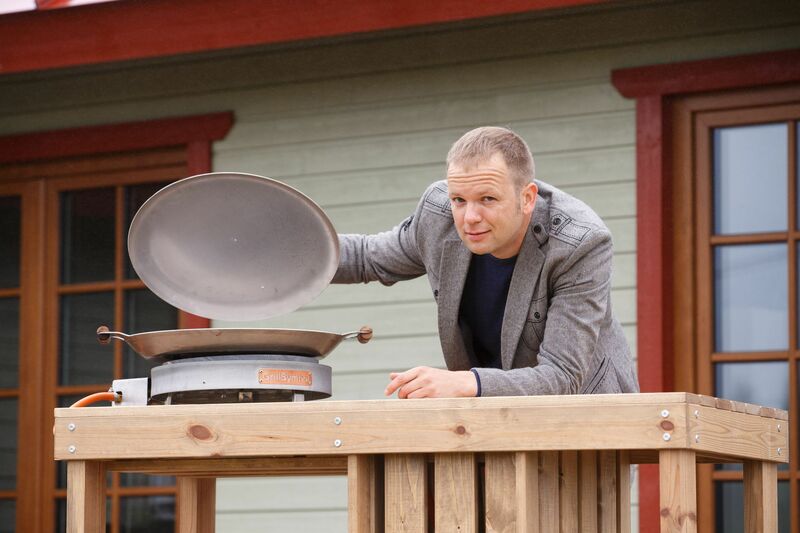 Steel and stainless steel pans of the same size weigh 10 kg maximum. A WOK-pan is ideal for cooking Asian dishes. Wok’s curved bottom enables the food to be stirred fast. A concave wok is also suitable for making different soups. Due to its depth, wok-pan can also be used as a fritter.